I’m concerned that we’re running out of cool things that we can lie to our kids about. There used to be all kinds of things we could lie to our kids about. “Daddy and Mommy were just wrestling… on the bed… naked.” Just kidding, I’ve thankfully never had to pull that from the repertoire. This all came crashing down the other night when my son lost a tooth. Now, granted we had already put on the “life schedule” that this would be the year that we tell the 11 year old son that there really aren’t any fat people in red suits or giant rabbits or leprechauns or fairies or anything of the sort that break into your house and leave you stuff in the middle of the night. In fact, we wanted to be perfectly clear that any people coming into the house in the middle of the night, whether that be through a chimney or a broken window or a busted down door, were likely sordid characters that were much more apt to be taking stuff from the house rather than leaving anything of value. 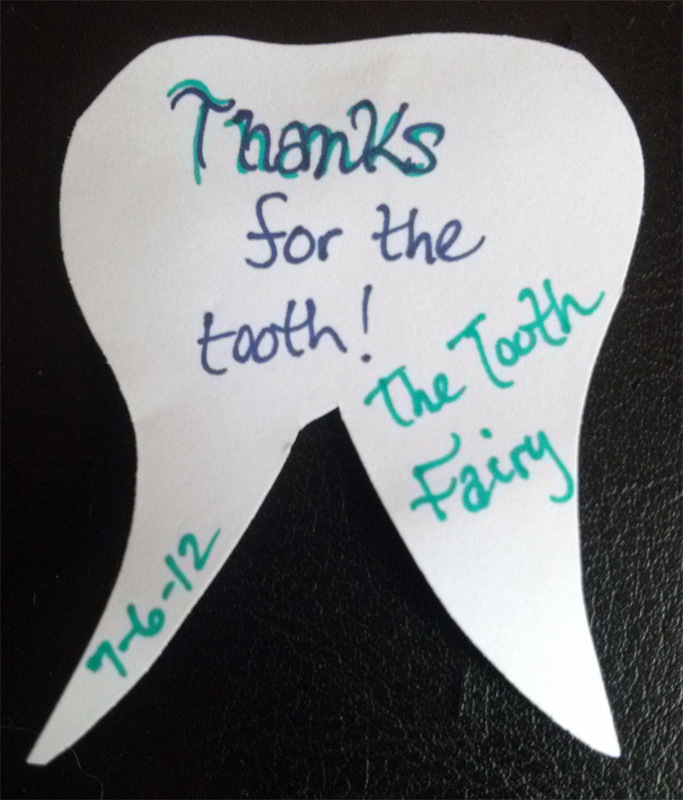 So our son loses a tooth on Friday evening… and Kim and I are lying in bed and she is doing the usual routine of cutting out a tooth shape from a sheet of paper, signing it in the tooth fairy handwriting (which I have to say looks very similar to the Santa Claus handwriting) and putting it and a couple bucks into a plastic baggie. ME: And why are we still doing this? HER: I’ll talk to him this weekend. I have to say, Mom’s rule the roost when it comes to stuff like this, at least in my family, although I suspect it’s that way in most families. Sometimes I wonder, if I had been a single Dad would my kids have had all the experiences with holidays and birthdays and special events that they’ve had with Mom around doing the vast majority of the work. Or would I have said “look son, I know you’re only three years old, but this whole Santa Claus thing… it’s a ruse, how about you go out and get a job to help pay for all this stuff.” I guess I probably would have stepped up but it likely wouldn’t have been quite as magical! Saturday morning arrives and son is a couple bucks richer. Mom pulls him aside… it went something like this. MOM: Can I talk to you about something? SON: (probably thinking he’s in trouble): Sure? MOM: Do you know who the tooth fairy is? MOM: Yes, do you know who else I am? And that was it. No shock and awe. No tears. No traumatic lifelong psychiatric issues. How long had he really known? When our daughter was told a few years ago at about the same age, there was lots of crying involved… even though, you know what? At a certain age, they know. In the backs of their incredibly intelligent little minds, they know… or at least they suspect. They’re just not ready to doubt anything their parents say… and in the long run, that’s a good trait to have. As emotional as it can be for parents to move beyond those precious years of childhood innocence, I have to say, we’re ready to take the next step. Actually we’ve already taken the next step… we’re there. Sometimes it feels like taking a step off a cliff, but that’s what a family is all about, finding our way through life’s challenges as a team. I love where my kids are right now, they’re so talented and interesting and independent and funny as they dive deep into adolescence and teenager-hood. Our daughter will be starting High School in the Fall, our son will be starting Middle School. It’s a big transition year and I am completely confident in their continued ability to stand out and shine. So, now we’re running out of cool things to lie to our kids about. … perhaps I can lie to her about that.